I’ve been on a cookie bake-a-thon lately and I’ve made more cookies in the last couple of weeks than I have all year, and for a very good and very obvious reason. The holidays! If you read this blog then you know that I’m all about wholesome plant based foods to help your body achieve health, balance and harmony. I’m big on whole grains, vegetables, nuts, seeds and unrefined sugars like fresh and dried fruits, grain syrups and malts, maple syrup and coconut sugar on rare occasions. I also recognize the importance of the occasional indulgence when seeking harmony and balance, it is far healthier for the mind and spirit than self deprivation. That said, a moment of pleasure on the lips doesn’t necessarily have to mean a lifetime on the hips, spiked blood sugar levels and cholesterol inducing saturated fats, not to mention abandoning your dietary habits and/or principles. That’s why I aim to create natural sweets, desserts and baked goods without butter, eggs, dairy or refined sugar. If I can avoid refined flour, and include whole food ingredients with some nutritional content, all the better. 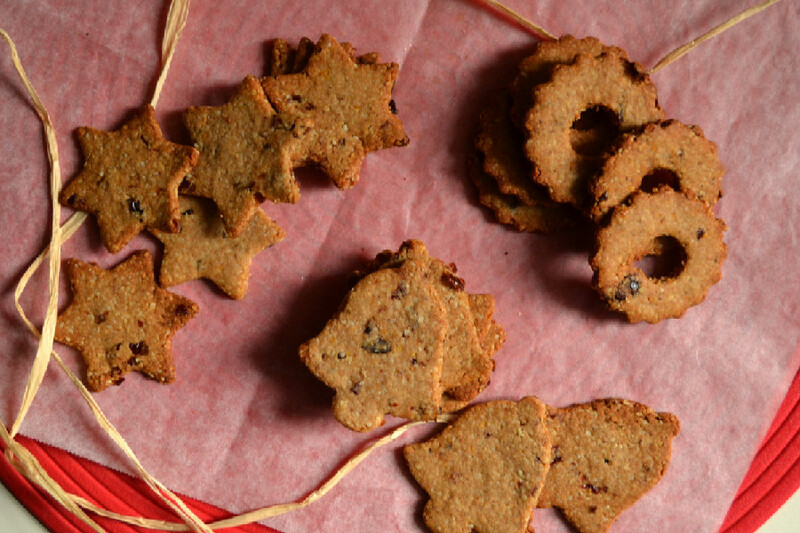 Enter these Cranberry Orange Christmas Cookies. They’re slightly crispy at first bite with a chewy mouth feel and a bold orange and cranberry flavour that’s complemented by the sweetness and nutiness of the chestnut flour, ground almonds and vanilla. I’ll spare you the nutrition bla bla bla, it’s a Christmas cut out cookie and should be enjoyed as such, but I’ll leave you with the comfort of knowing that you’re not consuming the saturated fats in a traditional butter cookie. It’s also gluten free, and flourless in that it doesn’t contain traditional refined flour, which is an added bonus if you have a gluten allergy or follow a grain free or Paleo diet. It also happens to be macrobiotic friendly. A win on all counts and a cookie for the people. These cookies are made from a mix of ground almonds and whole chestnut flour and are flavoured with freshly squeezed orange juice, freshly grated orange zest and apple juice sweetened dried cranberries. Wrap in plastic and store in the refrigerator for about 20-30 minutes, until firm. If it’s too hard when you take it out, let it soften up a bit before you roll it out. Otherwise, it will crack. Roll out the dough between two pieces of parchment paper into a thin layer. For wafer cookies, you want it quite thin, for a sturdier cookie roll it out a bit thicker. Use your favourite cookie cutter shape to cut out the cookies and transfer them to a parchment paper lined cookie sheet. If you roll them out too thin, they will be difficult to handle and might break when transfering and burn when baking. If necessary you can use a spatula to transfer the cookies. These look amazing! So fun. Thank you. They’re pretty fun to make and eat! !